First novel by a South African–born Indian now in the US: a would-be witty comedy of love and manners chronicling a courtship and marriage inspired by the author’s own immigrant grandparents. There is a promising premise to the story, one that goes back to Shakespeare: The shrewish woman who, forced by family to marry, eventually falls in love with her masterful spouse. Coovadia begins well, describing how Ismet Nassain, traveling through rural India by train in the late 1800s, is touched by an angel. The angel makes him fall in love with a young villager, Khateja Jhaveri, who is standing on the platform as the train pulls in. 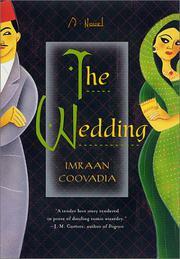 Nassain is compelled to track down the woman and propose marriage. Though Khateja’s family at first pretends to resist the proposal, they are secretly delighted to find a suitor for a daughter who has always been strong-willed and cantankerous. Threatened with marriage to the village idiot unless she marries Nassain, she reluctantly agrees but is determined to free herself as soon as she can. She fiercely resists Nassain’s well-intentioned blandishments but, smitten, he is patient and tolerant. Their relationship gets worse when they move in with Nassian’s mother, Rashida, who disapproves of Khateja. When their mutual dislike becomes literally inflammatory—Khateja causes a fire—Nassain decides the couple should immigrate to South Africa, where an Indian community is establishing itself in Durban. As Coovadia meticulously details the squalls of the still-unconsummated married life, the story groans into a tired riff on Khateja’s recalcitrance and Nassain’s suffering that’s barely enlivened by copious descriptions of ethnic food. Things aren’t helped by a sluggish pace, anachronisms (a polyester handkerchief, a radio in the early 1900s, etc. ), or the ending—meant to be tender and affirming but really just a perfunctory wrap-up—in which Khateja finally, and bathetically, capitulates. A neat concept that goes inert in the execution.